A snapshot of Alberta's finances shows the projected deficit continues to drop and revenues are holding steady, but the nose-dive in the price for Alberta oil could mean a much darker picture in the long term. Differential in price for Alberta oil and U.S. world price may point to darker picture in long term. In his second-quarter financial update, Finance Minister Joe Ceci zeroed in on what he called a brewing "crisis," as the gap between the price Alberta gets for its oil and the world price continues to hang wide open. "The oil price differential is a crisis in Alberta and a crisis for Canada," Ceci said at a news conference Friday, repeating the NDP's message that the federal government needs to step in to get Alberta's resources to tide water. "If we were a different region and in a different part of the country, the federal government would have no problem stepping in to help." The fiscal update only reflects activity from July to the end of September, so does not capture the potential impact of the oil differential over the past six weeks. The budget initially predicted a US $22 discount on Alberta oil compared to world standards. That difference now stands at closer to $30 per barrel, and is projected to average $26 by the end of the fiscal year. But the relatively strong oil prices at the start of the year helped to create a cushion for this budget update — it shows the provincial deficit forecast for 2018-2019 sits at $7.5-billion — about $1.3 billion less than originally predicted. But that cushion is expected to deflate if the price differential holds steady. The province downgraded its prediction for overall growth next year to two per cent. That would be in line with the Canadian average and would not signal a move into a recession. But UCP finance critic Drew Barnes accused the government of "hiding" from Alberta's economic realities. 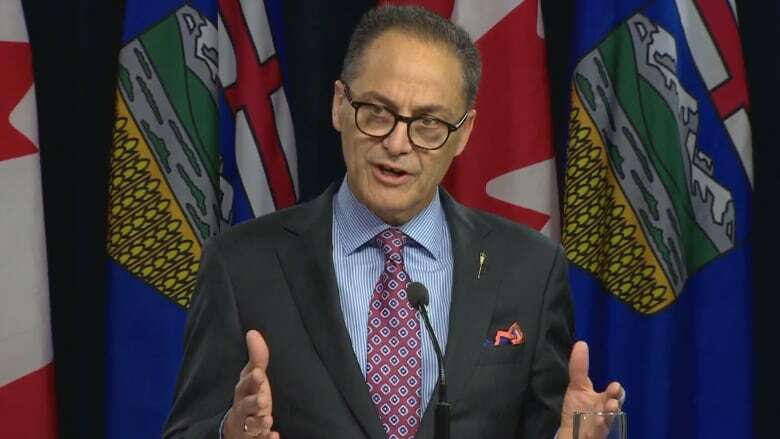 He also referred to the price differential as a "crisis that requires immediate action" and suggested the UCP's plan to curtail oil production would offer an immediate solution. "I think we're doing the right thing," Barnes said. "This is a short-term solution to a long-term problem." UCP leader Jason Kenney has called for the government to temporarily curtail Alberta's oil production by 10 per cent, in an effort to cut the glut of oil now stored in Alberta facilities. There would be a sunset clause to ensure the measure is temporary. Meanwhile, Premier Rachel Notley has said her government will buy two new unit trains that can transport an additional 120,000 barrels a day, increasing the amount of oil being moved by rail in Canada by one-third. The fight to get Alberta's oil onto the world market is also reflected in a $30-million budget item for the Treasury Department, reflecting the government's cross-country advocacy campaign for the Trans Mountain pipeline. Overall spending is now forecast at about $56.6 billion, about $440 million higher than initially budgeted. The additional money is being spent on items such as implementing the recommendations from the child intervention panel, changes to social assistance funding, and an addition $253 million for disaster assistance, including agriculture support through a spring drought and September snow, and summer wildfire activity.